Another brand of makeup you say? Don't you think the world has enough makeup for you to go crazy for? As a makeup enthusiast, makeup lover and a makeup artist, there will NEVER be enough makeup in our lives and we always welcome new brands with open arms! Especially a brand that promises not only good, quality makeup, but makeup that cares for your skin! Recently, a local brand called Happy Skin took "Instagram" by storm (@happyskin_ph)! I felt bad for not being able to attend the launch but I definitely cheered Jacqe Yuegtian-Gutierrez, Rissa Mananquil-Trillo and the rest of Happy Skin team for taking cosmetics up to the next level! Makeup, aside from going top notch in terms of quality is also looking aesthetically great! I got their cute lip product called Shut Up & Kiss Me early last week and I've been using both lippie for a couple of days! Though a bit early, I'm really excited to share my review on this! Whether torrid or tame, your lips will say it all! This Happy Skin Shut Up & Kiss Me Moisturizing Lippie is sure to help you make that smackin' statement. This lip-loving moisture stick is loaded with Shea Butter and Collagen to get fans to line up for a taste of those supple, hydrated, and ultra-kissable lips. High-pigmented, and moisture-packed, this lippie glides on irresistibly smooth (without the stickiness!) and leaves behind a rich, creamy pout that's way tempting to kiss. Super cute packaging. Catchy shade names I can easily remember! Twist type packaging so no sharpening needed. Applies on smoothly on lips. Hydration is good, does not magnify the lines around my dry lips. A lip liner and lipstick in one! Not widely available for now, we have to wait for them to be available in more Plains & Prints branches nationwide. True to what the product says, it is indeed moisturizing. Kept my lips hydrated all through the day with minimal touch up. Highly pigmented and one swipe goes a long way! Twist the body of the lippie to release the product. 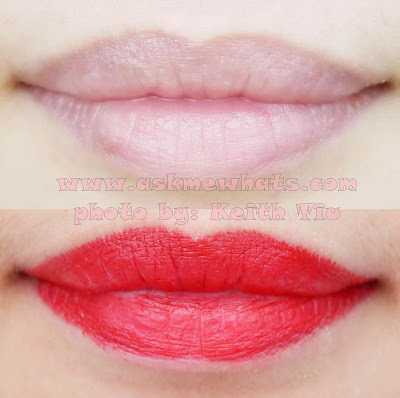 Line the borders of your lips to define your lip shape. Fill in the lips with color to create a creamy, rich pout. If you have dry lips, apply a generous amount of your favorite lip balm/lip treatment prior to lipstick application, wipe off balm before application to keep lipstick stay longer. Use the tip of the Happy Skin Shut Up & Kiss Me Moisturizing Lippie in outlining your lips (or to define the shape of your lips), use the flat surface to fill in the rest of your lips to keep the lippie from staying in shape. Once signs of irritations occur, stop using the product immediately. My First Time (red) would work well on all red lippie lovers! Just Married (pink) would look great on medium to dark skin tone. Fair skinned individuals can use this as a match with a dark eye makeup! Need to look "awake" even without much make up on? I highly recommend My First Time! This looks good even when worn alone! Priced at Php499.00 (approx $11.30). Available at Plains and Prints branches nationwide. Click LINK for exact list of branches. Just Married is a soft, pale pink shade that is matte yet gives good enough "moisture" when applied on lips. Keep in mind that my lips are EXTREMELY dry and this was applied without lip balm underneath so to speak, this product is quite impressive in terms of not flaking on me (as most pale pink lipsticks would). My First Time, the shade, has been called the dupe of MAC Rebel so many times! In terms of its purplish red shade, it does have a similarity with MAC Rebel, but the Happy Skin's version is more wearable on a daily basis! On photo, the color looks much like Ruby Woo from MAC but in person, it has a purplish tint that wasn't caught on camera! Have you seen Happy Skin Cosmetics at Plains and Prints stores? will you give Happy Skin Shut Up & Kiss Me Moisturizing Lippie a try? I'll definitely try this! thanks for sharing! Looks like a good product, but I think the price is a bit too high for a local product. 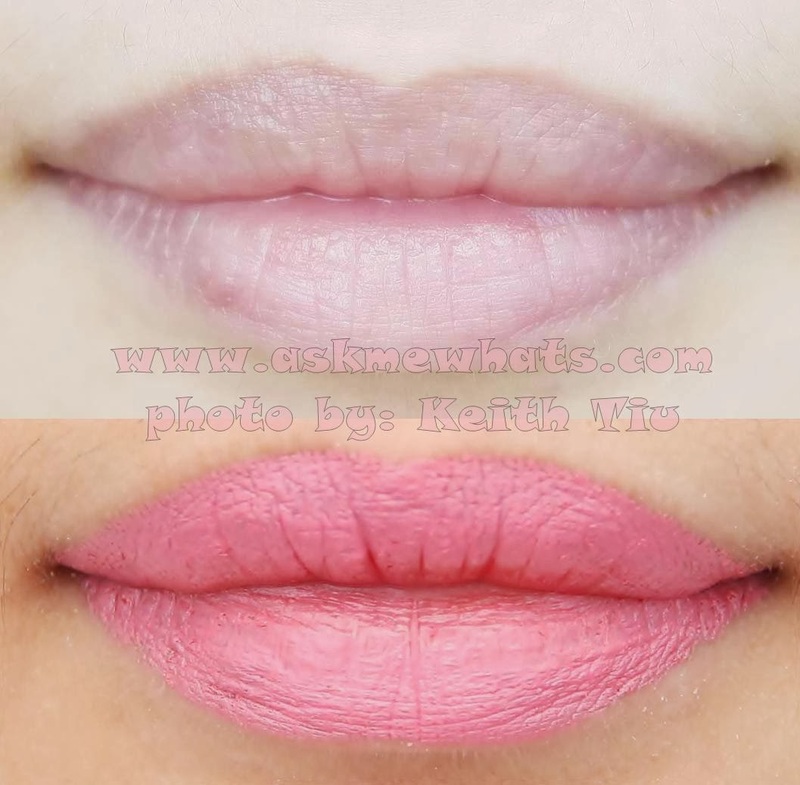 The lippies look similar to Revlon Balm Stain (which in US are much cheaper). I think the price is okay considering the quality, I am surprised how it doesn't flake or bleed on my lips and I read the product was sourced mostly from Japan, plus the quality is really good. I know what you mean about Revlon Balm Stain, they are also good, so it boils down to preference :) Thanks for sharing your thoughts! Give them a try! even on testers first, they are really hydrating and colors are super pigmented! a must-try. i need these kind of products; easily glide on the lips. :) thanks for sharing. I want lipstick that makes lips smooth when you apply.I hope this one is good.Is this available in malls? :) Thanks SJCAT for your thoughts! I'm glad you are happy! So cute, I want the Just Married lippie. what i like about these talaga is that they are unscented! but not as moisturizing nga lang as the revlon ones.